Pterostilbene, which is a close cousin of resveratrol, is a nutrient with high therapeutic potential. Taken as a dietary supplement, this polyphenol is known for its ability to prevent atherosclerosis, hypercholesterolemia, oxidative stress, memory loss, diabetes, many forms of cancer and a variety of other health problems currently plaguing modern society (1) (2). Product purity really does matter when purchasing a dietary supplement. The vendor should guarantee the quality of the dietary supplement being purchased, and the packaging should clearly state the ingredients and method of manufacturing. It is not currently possible to purchase a pterostilbene extract with a purity rating higher than blueberries. Blueberries are the primary source of pterostilbene supplements. Research is ongoing at preeminent higher education institutions such as Université Laval and CRIQ to develop advanced techniques to extract polyphenolic compounds from wild blueberries (4). The best pterostilbene available to consumers is a synthetic form of pterostilbene known as pTeroPure®. The pTeroPure® form of pterostilbene is manufactured by ChromaDex and has been shown to be pure and effective in clinical studies. Consumers should be wary of any pterostilbene product that claims to contain 100% pure blueberry extract. Fraudulent products, originating primarily in certain Asian countries, have captured an increasing share of the dietary supplement market in recent years. 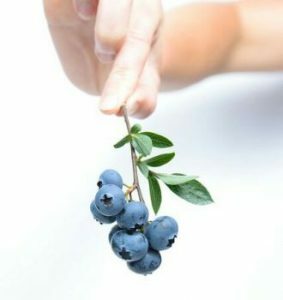 Although it is possible to isolate polyphenolic compounds from fruits such as blueberries, the quality of the extracted material is extremely poor. The only available extraction process is liquid chromatographic purification using a chemical solvent. The process is chemically aggressive, and the so-called extract can harm living tissues and bodily systems. Poor quality dietary supplements have also been shown to contain high levels of lead. Many of these poor quality extracts contain only dried fruit powder and are nowhere near as potent as pure and natural Dynveo pterostilbene. Although poor quality pterostilbene products can be purchased at bargain basement prices, they offer little therapeutic value to consumers. Many of these supplements claim to contain 10 percent pure extract, or 10 grams of dried blueberries to obtain one gram of extract, but such claims can be misleading. It actually requires a minimum of 50 kg of fruit to obtain a clinically relevant amount of pterostilbene. Dynveo pterostilbene contains pTeroPure pterostilbene, which is guaranteed to be up to 99.8% pure. The dosage of a pterostilbene supplement should also be taken into account. Although many venders sell pterostilbene capsules that contain as much as 100 mg of pterostilbene, smaller doses actually make more sense. It’s far better to take a 50 mg capsule two or three times daily to attain the recommended dosage of 100 to 150 mg. The reason for this recommendation is simple. Although its half-life and bioavailability are higher than those of its analog, resveratrol, pterostilbene is highly metabolized and rapidly eliminated by the digestive system. Therefore, it is preferable to fractionate the recommended daily dosage into several doses to maximize physiological activity and greater bioavailability of phenolic metabolites. Metabolites are products derived from the metabolism of phenolic compounds in the blood and target organs (5). Dynveo brand dietary supplement capsules contain only 50 mg of pterostilbene. The recommended daily dosage is 100 mg. Simply take one capsule in the morning and evening with a meal. Another significant consideration is the excipients contained in a dietary supplement product. Unfortunately, some supplement brands include additives such as maltodextrin, titanium dioxide and silica for the purpose of reducing production costs. Additives make it easier for the product manufacturing equipment to process the material. Consumers are advised to purchase pure and natural dietary supplement products that do not contain harmful excipients. Unnatural additives harm human health and cause undesirable complications. Vendors should be able to verify that every component of a dietary supplement was derived from a natural source. 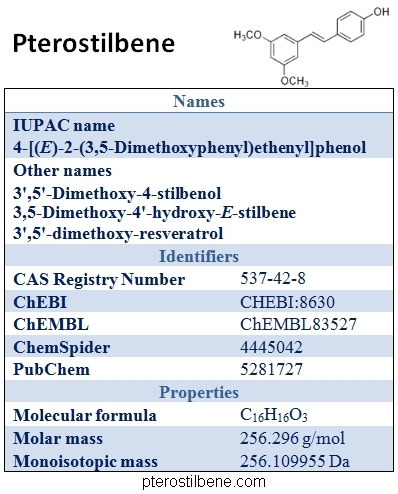 The list of excipients and methods of production used to manufacture a pterostilbene product should also be clearly indicated on the product package. Exercise caution before purchasing any product that was manufactured with an extraction process that uses aggressive solvents such as acetone or methanol. Dynveo’s 100% vegetarian pterostilbene powder is guaranteed to be non-irradiated, free of chemical excipients and other harmful substances. Dynveo pterostilbene capsules contain insoluble organic rice powder to facilitate penetration of the active agent. Dynveo pterostilbene is ideal for anyone who suffers from hypersensitivity or allergies. Dynveo dietary supplements do not contain gluten, yeast, dairy derivatives, GMO, or other known allergens. You can always rely on Dynveo brand dietary supplements to promote health and longevity. (1) Masternak MM, Bartke A. PPARs in Calorie Restricted and Genetically Long-Lived Mice. PPAR Res.2007;2007:28436. (2) Ugochukwu NH, Figgers CL. Modulation of the flux patterns in carbohydrate metabolism in the livers of streptozoticin-induced diabetic rats by dietary caloric restriction. Pharmacol Res.2006 Sep;54(3):172-80. Epub 2006 May 1. (4) Projets : Développement d’un procédé novateur d’extraction du ptérostilbène à partir des bleuets sauvages. Financé dans le cadre de : Programme 2014-2015 : 11e Appel de projets – Avril 2014. Institutions de recherche : CRIQ, Université Laval. (5) Singh et al, Nielsen, Williamson, Scholz, Holst 2008.